Toshiba's Satellite Pro range is designed for business use, but solid build quality, strong usability and decent specifications make the C660-1UX suitable for home use. Its sturdy plastic chassis has all the resilience you'd expect from a business machine. The textured, matt finish feels great and protects well against scuffs and scratches. Build quality is impressive throughout, with no flex in evidence on any of the panels. Even the thick screen is well put together and sure to withstand frequent family use. The keyboard is fixed well to the chassis and there's almost no sign of flex when typing. The keys respond accurately, although a long range of motion can cause occasional errors when typing at speed. However, by striking the keys firmly, it's easy to avoid such problems. Photos and videos look great and the Super-TFT coating is one of the least reflective we've seen. The Toshiba lacks an HDMI output, though, so you can't connect to your TV. An analogue VGA – or D-Sub – port is fitted, for connecting older PC monitors and projectors, but the lack of HD connectivity is surprising for such a new laptop. If you're looking for a tough, usable laptop with a great screen, the Satellite Pro C660-1UX is a good choice. With such high-quality rivals, though, its limited power and features are far too pronounced. 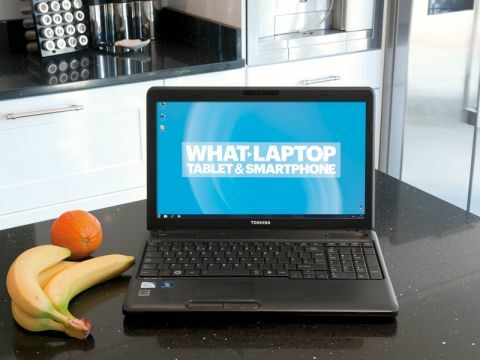 The similarly priced Samsung 200B5A provides better value for money, making the Toshiba hard to recommend.